A group of our NSW Committee members are on a self-funded tour to Laos to visit some of the volunteers, trainees and projects they have funded over the years, and to also learn more about Australian projects in the region. 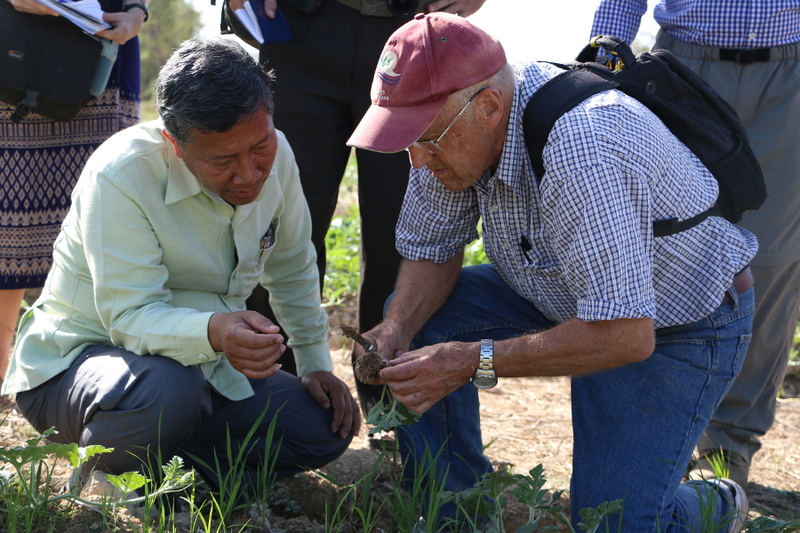 The group is being ably led by Lester Burgess who received the Crawford Fund medal for his many years of effort around plant pathology in the region. Lester has been active running a range of training programs but also in developing opportunities for young Australian volunteers to build regional capacity around plant pathology with volunteers from Scope Global, an Australian government funded volunteer program. Lester and his wife Jillian have been in Laos for some weeks now, with Lester doing field trips and Jillian teaching English, but the NSW Committee are now in-country. Helen Scott-Orr, coordinator of the NSW Committee, is sending us photos and descriptions of what they are experiencing. Place your mouse over the photo to read its caption. 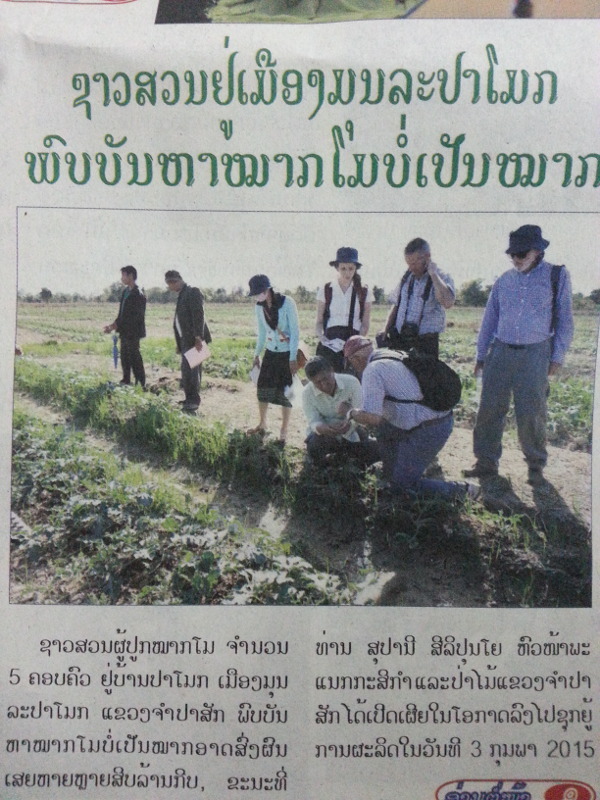 The visiting team inspecting a watermelon crop with Head of the Champasak Provincial Agriculture and Forestry Office, Mr Souphany Silipounnyoh. 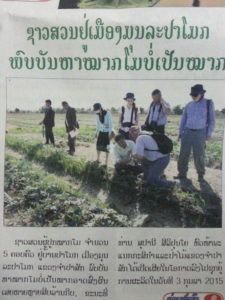 Visit to Laos by our NSW Committee makes the Champasak Weekly. 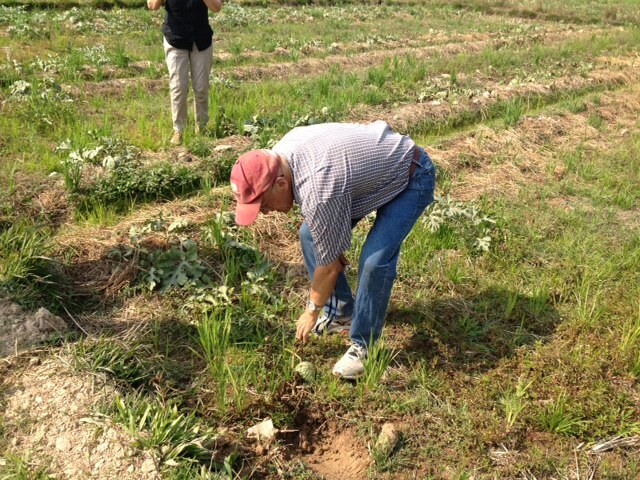 Pictured kneeling is the Director of the Department of Agriculture and Forestry inspecting a watermelon crop. 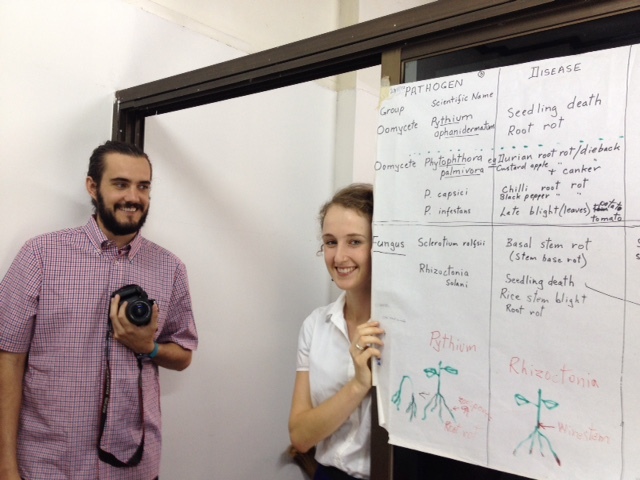 (L-R) Lyall Grieve, Sophia Callaghan and Adam Williams are volunteers placed by Lester with Scope Global support to work in Pakse and Savannakhet on entomology and plant pathology with the Provincial Ag and Forestry Office (PAFO). The Laos in the photo are all young trainees who are working with the volunteers. Lester and Jillian have been training the group for the last month and they gave the NSW Committee presentations in English about significant vegetable and fruit pest and disease problems in Southern Lao. In the foreground are simple cultures for soil fungi using rose petals as the growth medium rather than expensive and unavailable lab media – Lester has taught the group how to do this successfully. 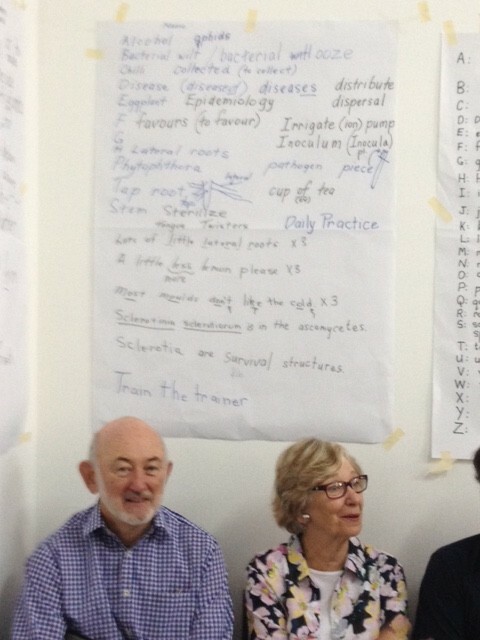 Jillian Burgess sitting with Bruce Standen from our NSW Committee, under one of the English posters used by Jillian in her English classes. 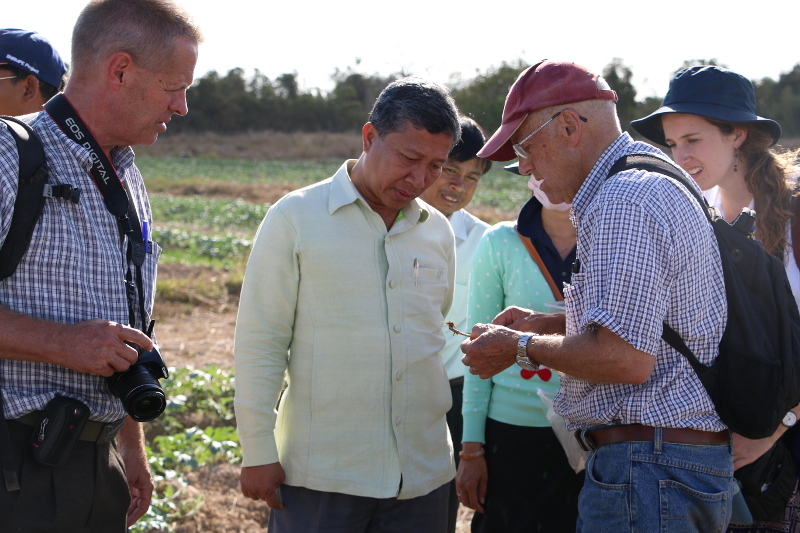 Lester inspecting wilting watermelon vines near Champasak. Watermelon is a quick cash crop at this time of year but this farmer’s efforts would not be rewarded as most vines were affected by wilting from the tips of the plant. 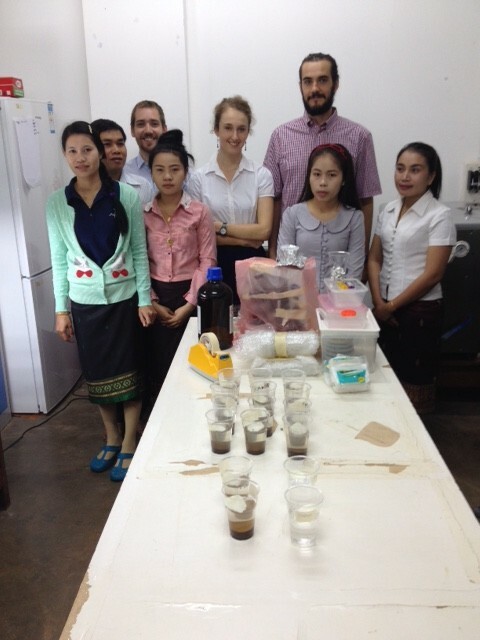 Scope Global volunteers, Sophia & Adam, working in Laos on disease diagnosis for more clean healthy vegetables and less disease. Five families growing watermelons in Pamok Village, Champasak Province are having problems with watermelons: the plants don’t produce fruit. This might cause losses worth tens of millions of kip, Mr. Souphany Silipounnyoh, Head of the Champasak Provincial Agriculture and Forestry Office, revealed when taking the opportunity to go into the field to motivate production on February 3, 2015. He said that the reason is that the soil is depleted and hasn’t been restored and improved after being used for cultivation for many seasons.